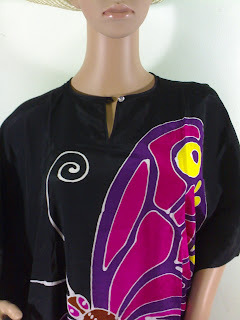 Batik Kaftan Crafts - Handmade Batik Kaftans Muumuus Longdresses: A Closer Look at Handrawn Batik Kaftan Muumuu Dress Butterflies - Our Latest Collection. A Closer Look at Handrawn Batik Kaftan Muumuu Dress Butterflies - Our Latest Collection. Well, I have just posted our latest collection of batik kaftans. Must say I am pretty excited as it has been some time when a trend took over the Malaysian batik kaftan scene. You see, painting animals in sometime a taboo to the Malay community in Malaysia. That is why you hardly see animal motives in Malaysia batik, its usually flora - flower, veins and plants. So, it's a bit of different when a creative batikers uses butterflies as it muse. I supposed butterly as a kind of insect can be accepted. It is also a universal symbol of beauty and freedom. This batik kaftan featuring butterflies are mostly ankle length. 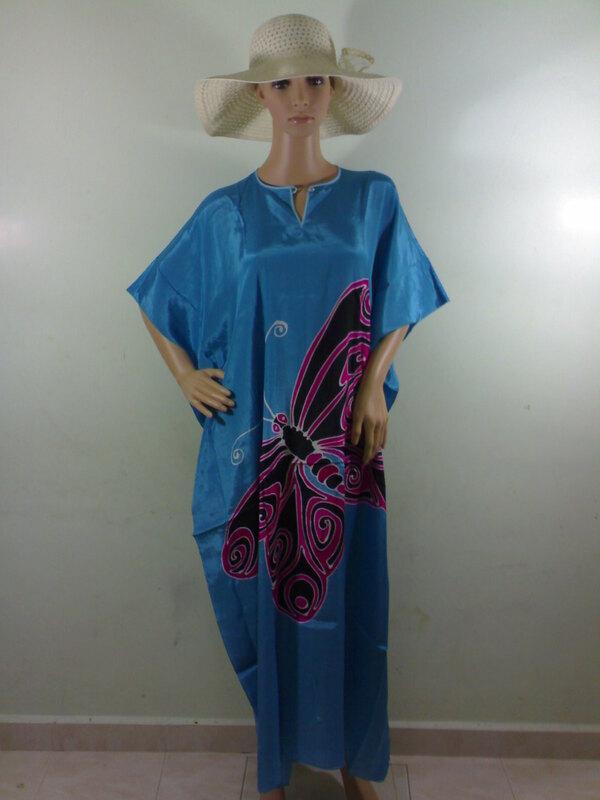 There would be a single butterfly drawn in front and another at the back of the kaftan. 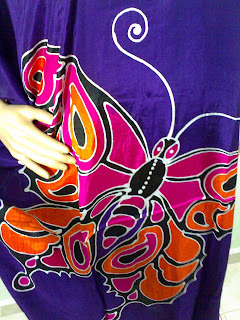 This batik kaftan would be coloured mainly in one solid colour with contrast colour given to highlight the butterflies. As you can see from our collection, some butterflies colours are demure while some are a bit more fun and colourful. The collar in this collection is round collar with button. There are also some with plain white background. The whiteness would give the kaftan a bit of sheerness - perfect for keeping cool in the summer. The black ones are also elegantly beautiful and a perfect setting to the butterfly design. Love to see more, browse our batik butterflies kaftan selection here!